Δείτε το, αλλά κυρίως ακούστε το στο South Sounds στη Γλυφάδα. 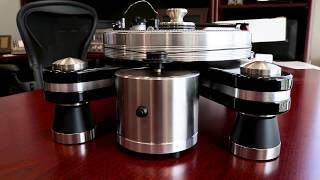 "There are several models of tank that would feel slightly uneasy standing next to the VPI Prime Signature, such is the sturdy build quality on show here. Despite the multi-part nature of the installation for this turntable, it’s a pretty straight-forward sequence that offers much that is friendly but it’s that sound quality that is the gold star element in the Signature Prime’s armoury. Solid as a rock, oozing detail but blended successfully with clarity. All I can advise, in my simple, innocent, yet hopeful way is to tell you to buy this deck or, if an angled entreatment is more attractive, buy this deck or if you are suffering from hearing difficulties BUY THIS DECK! Got that?"